Railpictures.ca - A.W.Mooney Photo: CN 4513 and 4523 seen here with the local for Brantford. Another caboose up front for running around the train upon return. Interesting this leader has a snow shield affixed, suggesting occasional plough service. There were a few of these units with such; I recall 4514, as well as a couple of cab units sporting this equipment back then. | Railpictures.ca – Canadian Railway Photography – photographie ferroviaire Canadienne. 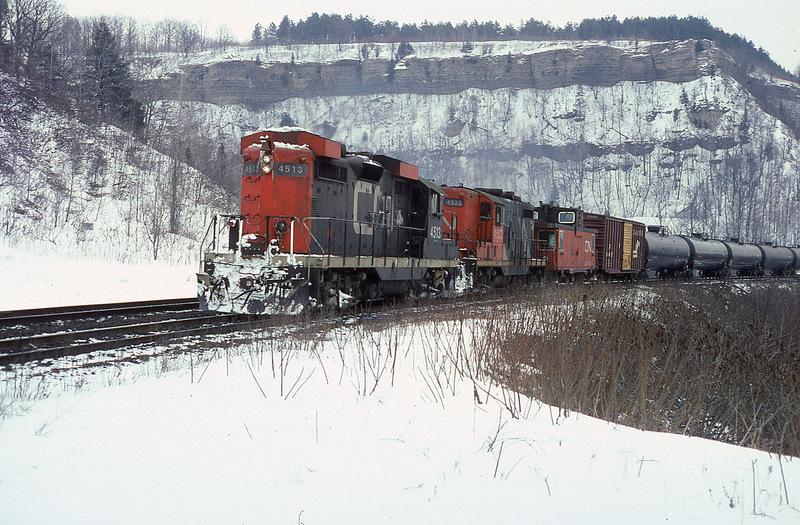 Caption: CN 4513 and 4523 seen here with the local for Brantford. Another caboose up front for running around the train upon return. Interesting this leader has a snow shield affixed, suggesting occasional plough service. There were a few of these units with such; I recall 4514, as well as a couple of cab units sporting this equipment back then.